This is the 33rd sthalam on the southern side of river Cauvery. 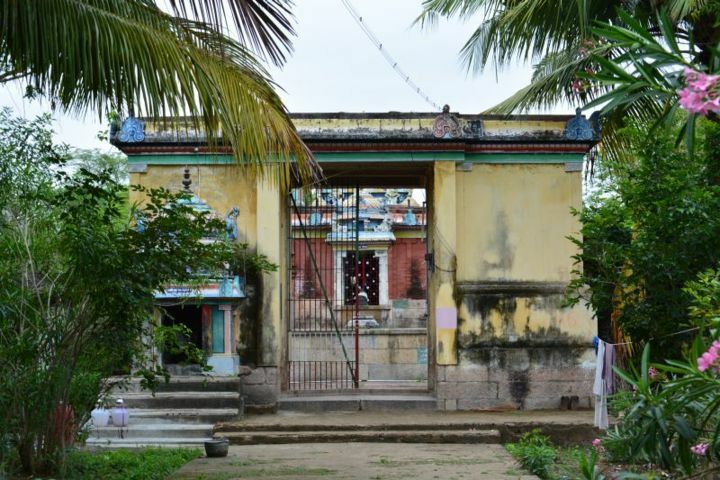 Thiruganasambandar has sung hymans in praise of Lord Shiva of this temple. 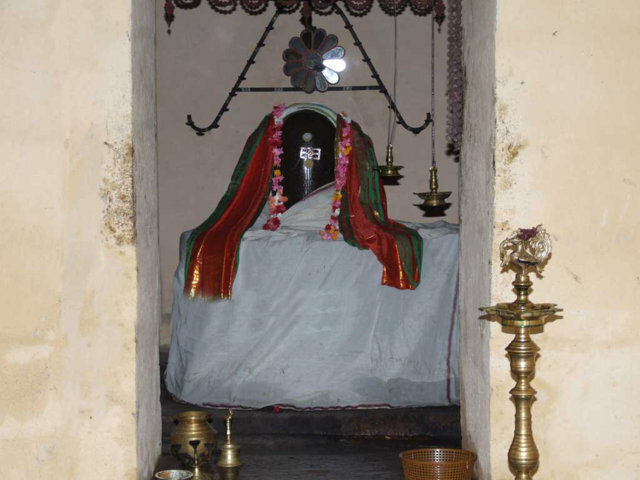 Vaikan maadakkoyil refers to two shrines, Vaikal and Maadakkoyil. (8km from Aaduturai railway stn). Vaikal enshrines Vaikalnathar and Vaikalambika. Vaikanmaadakkoyil is considered to be the 33rd in the series of Tevara Stalams in the Chola kingdom located south of the river Kaveri. The Maadakkoyil is one of the 78 maadakkovils built at an elevation by KoChenkan Cholan. 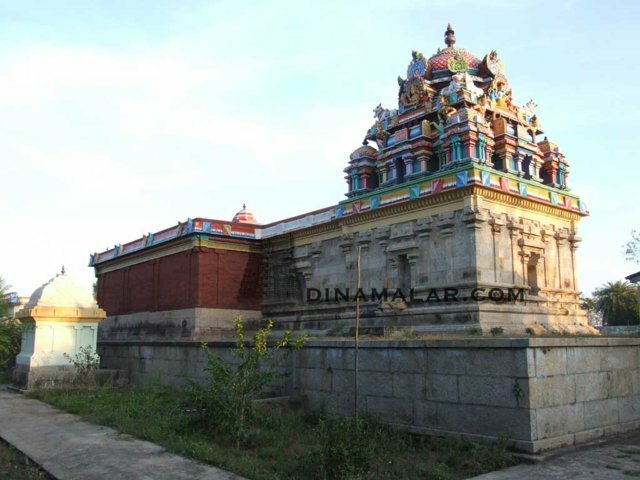 Komaleswarar and Ilankothai Amman are worshiped in the Maadakkoyil. Vishnu, Lakshmi and Bhrama are said to have worshiped Shiva here. Shiva is also referred to as Bhramapureeswarar. Sambandar has glorified both these Shivastalams in one Patikam. 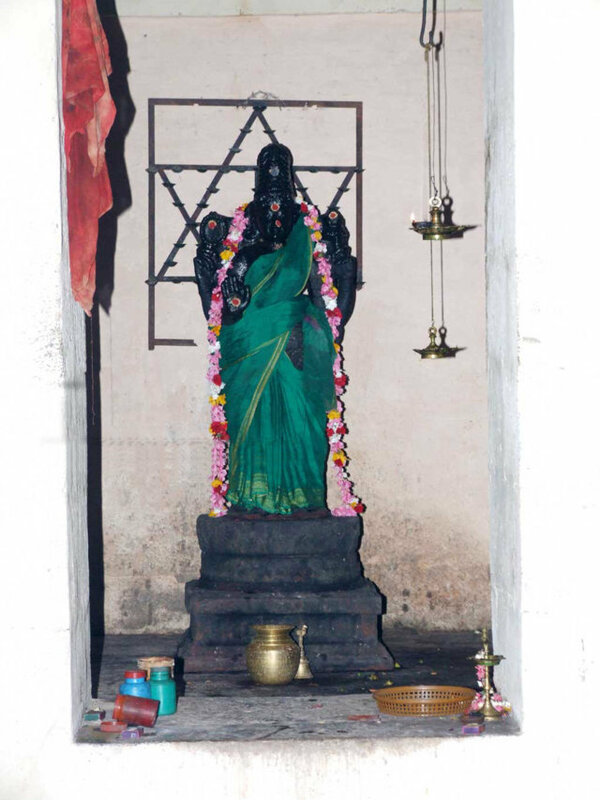 Sri Lakshmi worshiped the Iraivan of this temple. The Maada temple was built by Ko chenkat Chozhan. Maadakovil is a class of temples built mostly by Kochengat Chozhan where he built the main temple on a platform which was about 4-5 above the ground (some of them even higher). This is because of a legend that he was a spider that reborn; and in the legend there is an elephant which kept destroying the spider web. So even in the next birth, he is supposed to have hated (or afraid of) elephants, and built most of his temples on a raised platform so that elephants cannot reach the sanctum sanctorum. Anyway, back to Vaikal. The road to here is a bit on the narrow and wild side. The road twists and winds through paddy fields and thick bamboo thickets. You will not find too many people to ask directions to here either. Beautifully peaceful temple. Nice temple pond also. 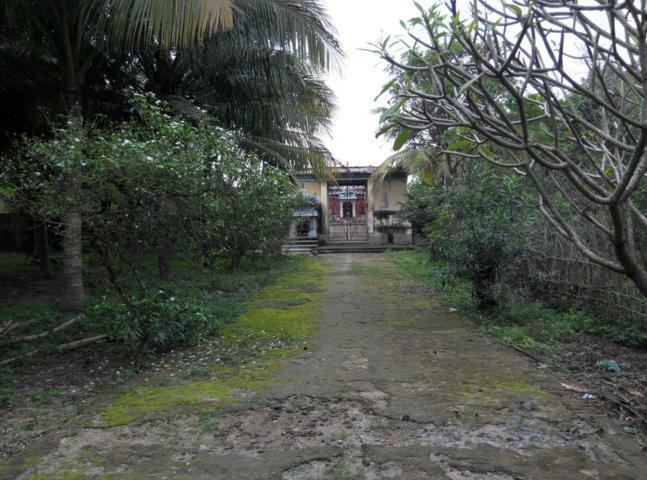 This is one of the Mada temples built by Kochengannan. As the three eyes of Lord Shiva, the place has three Shiva temples. The right eye of the Lord is Viswanatha-Visalakshi temple, the second left is with Lord Brahammapureeswarar with Mother Perianayaki and the third forehead is for Lord Vaigalnathar with Mother Kombial Kothai. 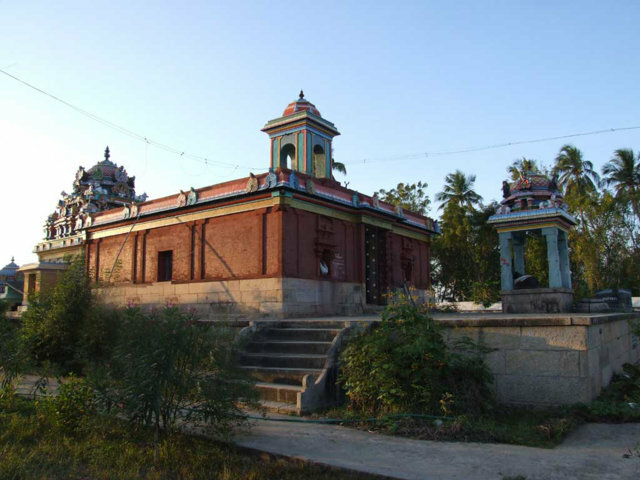 Lord Brahmma, Lord Vishnu, Mother Mahalakshmi and Sage Agasthya had worshiped in this temple. Mother Earth –Bhoomidevi prayed to Lord Maha Vishnu to marry her which Lord obliged and had Her as His consort. This was not acceptable to Mother Mahalakshmi and left the Lord. She came to this Shenbagavanam and took on a severe penance to get back her Lord. Lord Vishnu and Bhoomidevi came in search of Mahalakshmi. Brahma followed in search of Lord Vishnu. They found Mother Mahalakshmi here and prayed to Lord Shiva. By the grace of Lord Shiva, Lord Vishnu had both Lakshmi and Bhoodevi as His consorts. Lord Shiva is a swayambumurthy in this temple. 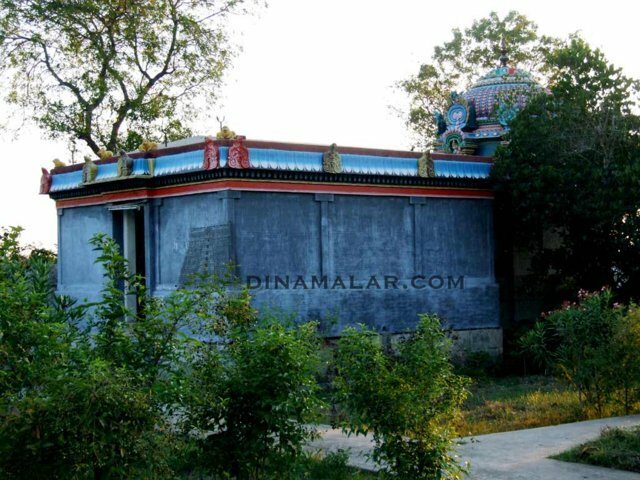 Location: This sivasthalam temple is located 7 Kms from Thenkurangaaduthurai sivasthalam. Nearest railway station is Aduturai which is on the Mayiladuturai - Kumbakonam section of the Southern Railway. Nearest town is Kumbakonam. On the bus route Kumbakonam to Karaikkal, after Thiruneelakkudi get down at Paliyangiya nalloor and the temple is 2 KM from there. Frequency of bus is limited.